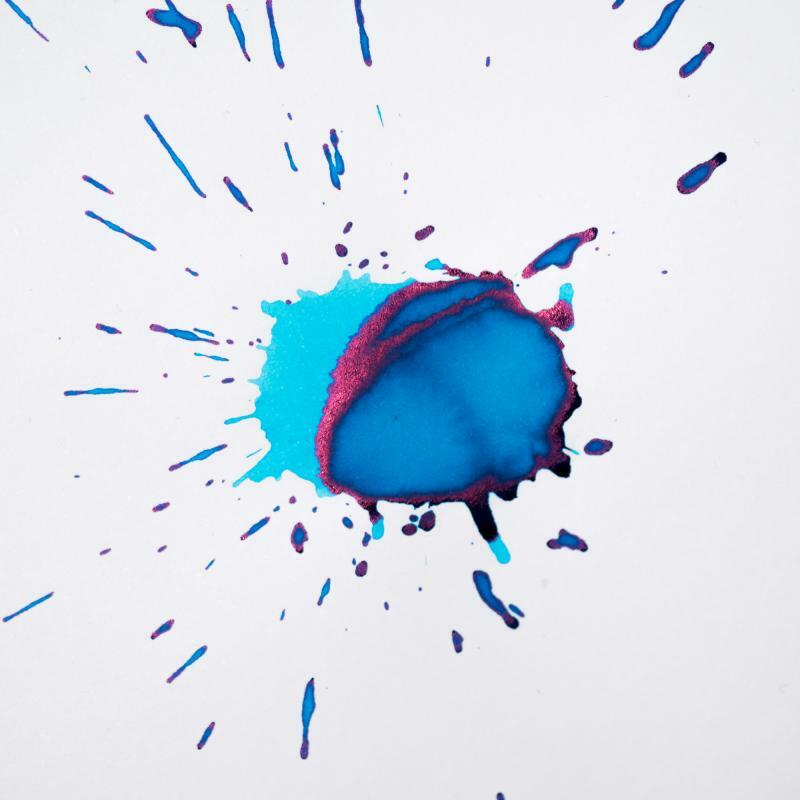 Here is the deal... Pacific ink looks just like the Turquoise ink. 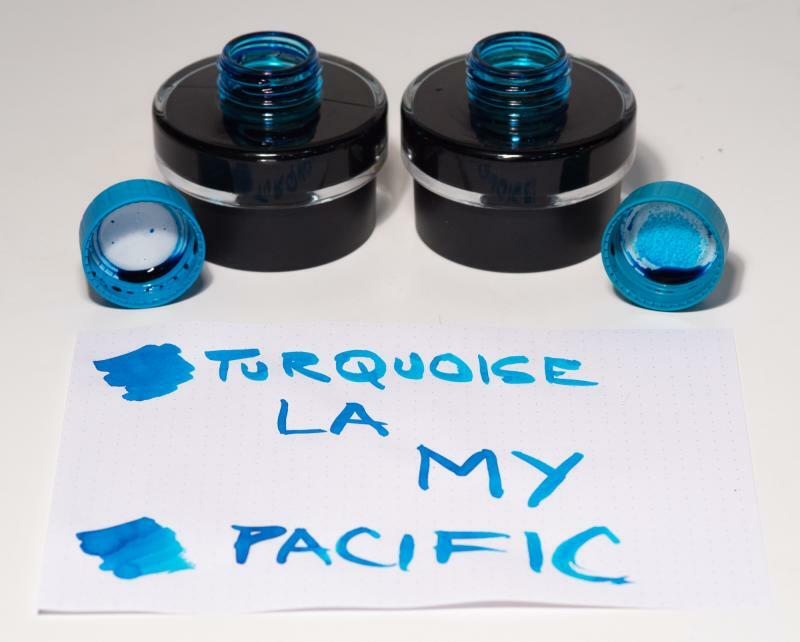 Lamy responded that these two inks are actually identical and Pacific will only differ from Turquoise by the packaging. They don't even look different by the bottles. I am guessing he meant the "box" when he said packaging. I don't need this one this year. Bit of a disappointment after Dark Lilac. I'm hoping that like last year the 'real' LE ink will be based on the Safari not the Al-Star. Hmm. At least I like the colour of the pen though. I might be tempted into buying one of those. Lamy Turquoise is one of my favorite and most frequently used colors. It has a lovely red sheen. But it seems like something of a cheat to rename it in an attempt to get people to buy it as if they hadn't been selling it for a while. On the other hand, maybe people will "discover" it. Neither appeal to me, but I am seeing that the Pacific is a tiny bit lighter than the Turquoise, in the photo. It occurs to me while reading this thread that a lot of the De Atramentis inks are relabeled (the Famous People line, the Zodiac series, some of the scented inks). And nobody makes much of a fuss about them, other than trying to figure out what they all are. I'll share a writing sample when my bottle of Pacific arrives on Tuesday. Thanks for comparing & sharing. 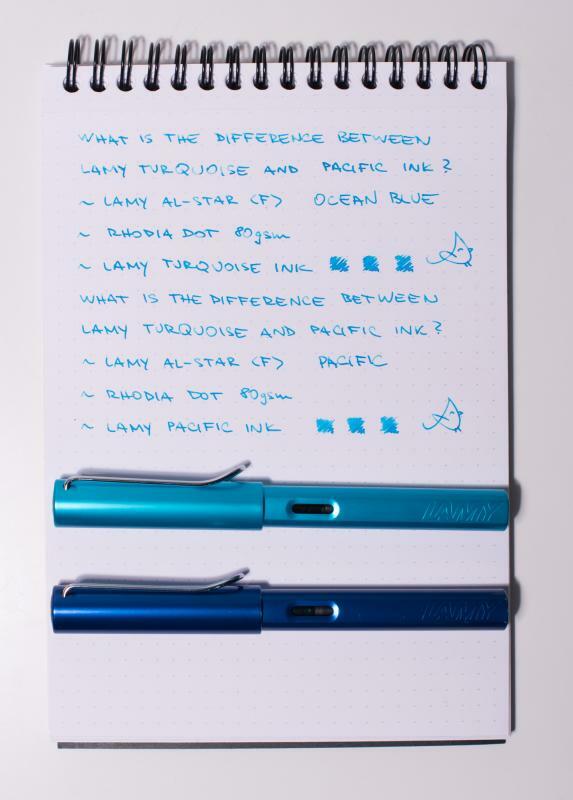 If Lamy say that Pacific and Turquoise are identical then I assume they should know. I'm disappointed in one way, because we were advised that future LE inks would also be available within Europe. Perhaps this is their way of ensuring that they are. I hope they are also the same price. I believe the 2017 LE ink is the petrol blue. It's announced to arive at shops on april 2017. Edited by rafapa, 26 February 2017 - 10:29. The Turquoise cap is a yellower shade than the Pacific Blue cap. Scroll down to see a picture at a Goulet Pens review, here. My own bottles of each show the same difference in hue. Edited by taimdala, 02 September 2018 - 23:01. If the two inks are indeed the same, I won't be as upset when I use up the Pacific Blue I already have. The color shown by the big dot on the top of the box, and by the sketch's top of the bottle (below the lid) on the front of the box. Yes, also by the color of the real lid itself. The barf code shown on the bottom of the box. In the case of Turquoise, this is 4 014519 089346 . You might want to see what that code reads on a Pacific box. I wouldn't have minded if they went all the way and spent the time and money and effort to print what color the ink actually is, like "TURQUOISE". 1-2-3 languages wouldn't hurt... it doesn't have to be 7 (seven) like Montblanc whips out. MB is more expensive, but then you know what you have in front of you.